Caffeine, one of the most popular stimulants in the world, is present in coffee, tea, chocolate, energy drinks and some colas. Caffeine stimulates the central nervous system and decreases fatigue by interfering with a chemical in the body that promotes sleepiness. While in moderation caffeine is harmless, too much can make you feel anxious and irritable. 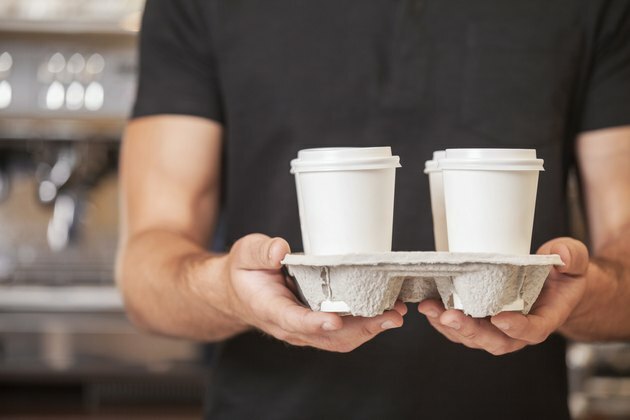 Drinking upwards of four caffeinated beverages a day -- or more than 500 to 600 milligrams of caffeine -- can cause an upset stomach, heartburn, inflammation of the lining of the stomach and abdominal pain. How to treat your symptoms depends on how caffeine affects you and how much you consume. One cup of coffee contains between 100 and 200 milligrams of caffeine, depending on the type of coffee. Don't eat anything. Until your symptoms dissipate -- which they will after an hour or so -- refrain from snacking and skip meals. The good news is, you probably won't have an appetite. Drink four to six glasses of water throughout the day. Caffeine is an acidic beverage that can cause gastritis, according to the University of Maryland Medical Center, UMMC. Flushing your system with water could help reduce discomfort and other symptoms. Try an over-the-counter medication that neutralizes stomach acids. Get your doctor's advice on which one would be most likely to help you. The most frequently reported symptom from caffeinated coffee consumption is heartburn, according to a 1999 review of literature on coffee and gastrointestinal function in the "Scandinavian Journal of Gastroenterology." The researchers, from the department of gastroenterology at the University Hospital Utrecht in The Netherlands, suggest that Pepcid AC, Zantac and Tagamet HB can treat heartburn without causing acid rebound -- a condition that causes the stomach to produce more acid. Chew on an herbal peppermint tablet or licorice two or three times a day or an hour before drinking caffeine to calm a peptic ulcer flareup. Drinking large amounts of caffeine can cause inflammation of the lining of the stomach or irritate an existing condition. UMMC encourages utilizing these herbal remedies for gastrointestinal inflammation. Avoid stomach problems altogether by drinking decaf beverages or limiting your caffeine intake to two coffees, energy drinks or colas a day. Consuming upwards of four caffeinated beverages daily can cause an upset stomach. In the past, doctors suggested eating a bland diet for the treatment of gastritis and ulcers, two stomach problems associated with caffeine intake. Today, specialists know that bland foods will neither help nor hurt, according to the University of Maryland Medical Center. Symptoms typical of drinking too much caffeine -- abdominal pain, a feeling of fullness, gas, nausea, vomiting and diarrhea -- will dissipate on their own, according to the Cleveland Clinic. Reading labels on energy drinks can save you a lot of pain and suffering. After complaining about abdominal pain for two months, a Los Angeles teen was diagnosed with severe inflammation, intestinal bleeding and ulcerations from drinking several highly caffeinated energy drinks daily. The instructions on the product suggested consuming only one serving a day, which contained 250 mg of caffeine. Antacids are not effective for common stomachaches and those associated with caffeine intake. They may even increase acids in your stomach, worsening your symptoms, according to Ronald Hoffman, M.D., a past president of the American College for Advancement in Medicine. If your symptoms persist for more than a day, you should call your doctor. If they worsen, you may need to go to the emergency room, especially if you vomit blood, begin losing weight, have no appetite, have tar-like or bloody stools or severe pain in the upper right abdomen.